Spanish cyclist Alberto Contador went to sport's highest court on Monday to argue his case that contaminated meat caused his positive drug test at the 2010 Tour de France. Contador did not speak to reporters as he arrived at the Court of Arbitration for Sport in Lausanne, Switzerland, for a four-day hearing into one of the most scrutinized doping cases of recent years. Wearing a black suit and dark tie, he was accompanied by brother and manager Fran Contador and a team of elite sports lawyers. Contador's legal team will argue that a contaminated steak he ate on a rest day in the Pyrenees caused his positive test for clenbuterol, a banned anabolic agent. If found guilty of doping, Contador can expect to receive a two-year ban and be stripped of his 2010 Tour title and his 2011 Giro d'Italia victory. 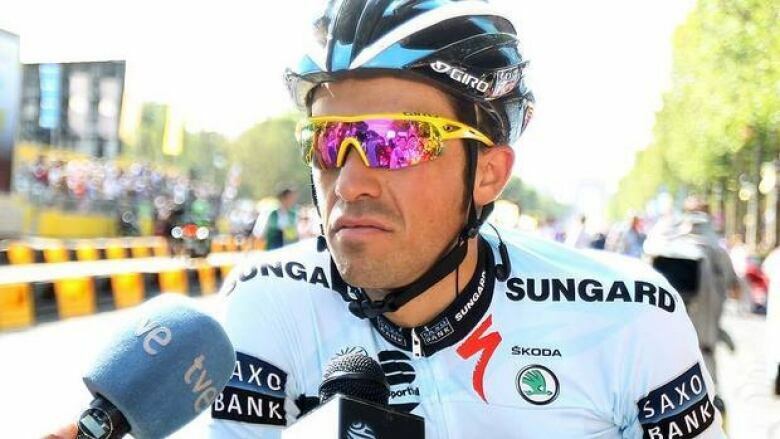 The International Cycling Union and World Anti-Doping Agency appealed to CAS after the Spanish cycling federation cleared Contador of blame last February. About 20 witnesses are expected to appear at the hearing, including the Spanish butcher who sold the steak, a polygraph expert and anti-doping scientists. The three-man arbitration panel, composed of Israeli chairman Efraim Barak, German law professor Ulrich Haas and Geneva-based lawyer Quentin Byrne-Sutton, is likely to issue its verdict in January. "A decision is not expected before the end of the year," CAS secretary general Matthieu Reeb told reporters. The panel was hearing brief opening statements by the respective legal teams before the inquiry moved across Lausanne to the International Olympic Committee headquarters to use a room equipped with simultaneous translation services. The case opened in the CAS boardroom with Contador flanked by Andy Ramos, his Spanish lawyer, and Mike Morgan, an expert in sports doping cases from England. Morgan used procedural errors to help Chinese judo world champion Tong Wen overturn a two-year ban after she tested positive for clenbuterol. Tong claimed she had consumed contaminated meat in China, where the muscle-building, fat-burning drug is widely used to bulk up livestock. Swiss lawyer Antonio Rigozzi and another London-based lawyer, Adam Lewis, were also on Contador's side. Lewis helped Belarus hammer throwers Vadim Devyatovskiy and Ivan Tsikhan regain their Beijing Olympic medals after they tested positive for elevated levels of testosterone. A CAS panel in that case, which included Haas, reinstated the Belarussians because their doping control samples were mishandled by the Beijing laboratory. However, the court ruling insisted they were not exonerated of suspicion of doping. Contador's team nominated Haas to the panel. The UCI and WADA nominated Byrne-Sutton and the court appointed chairman Barak. The UCI's case was being presented by the governing body's legal director, Philippe Verbiest. WADA legal director Olivier Niggli led the anti-doping watchdog's team.